Shipyards of the future will probably utilize shiplift and land transfer systems, such as this one at Todd's Los Angeles Division, rather than floating dry docks or shipways. This high technology facility, permits the performance of construction or repair work on five ships simultaneously. Additionally, computer aided design and computer aided manufacturing (CAD/CAM), as well as on-line robotic welding are an integral part of Todd's shipbuilding expertise. 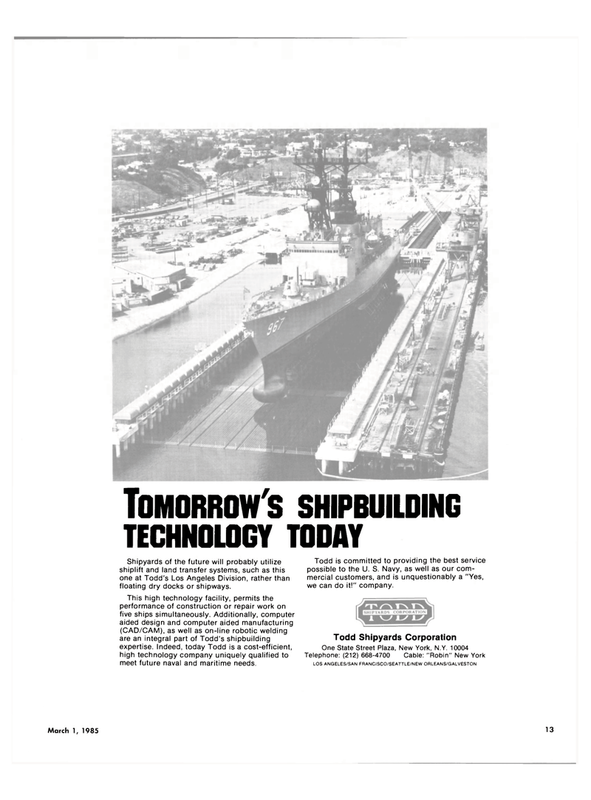 Indeed, today Todd is a cost-efficient, high technology company uniquely qualified to meet future naval and maritime needs. Todd is committed to providing the best service possible to the U. S. Navy, as well as our com- mercial customers, and is unquestionably a "Yes, we can do it!" company.